One thought prevailed above all others during our drive around the North Coast 500: imagine what it would have been like to travel this land via horse. The sprawling hills, the great Munros, the glistening lochs… my imagination ran wild. Sure, I know I’m romanticizing the image – I’ve been on more than enough horse rides to know how sore you can be and how long it can sometimes take – but to experience the uninterrupted majesty of the land would have been amazing. By the time we had arrived in Thurso, the weather was miserable and we were unable to explore the little town. The next morning, however, we awoke to the brightest sun we’d had yet! That treat was mildly spoiled by the forecast of the strongest winds I’ve ever been in. Still, we set out with optimism and a goal to make it to Smoo Cave. Our first random find of the day was accidentally stumbling upon the Marie Curie Field of Hope. We had pulled over to take a picture of something entirely different, but the small field caught my eye. The foundation offers care and support to people with terminal illnesses. It felt special that out of all the places we could have pulled over, we ended up there. 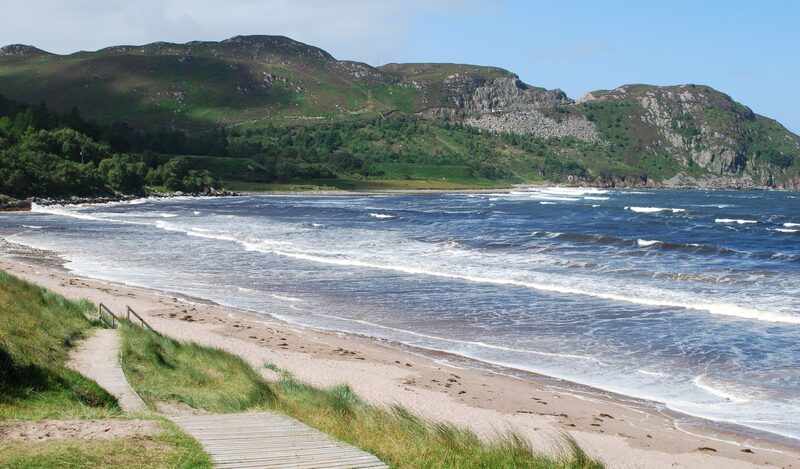 Our next stop offered a stunning view of Coldbackie Beach. Although we didn’t venture down, the view could not have felt more perfect. The water was rough, and the winds were picking up, but staring out at the water was incredibly peaceful. Even though we shared the spot with other North Coast 500 adventurers, the location felt isolated. We continued our drive, the strength of the winds increasing. I knew from research before our drive that Smoo Cave would close with short notice due to any form of rainfall – the cave could easily flood – and I was worried it would extend to high winds. Everything felt different about being in the Highlands. Though we passed other cars and shared scenic look outs with other people traveling the North Coast 500, we largely felt isolated and alone in the great wide world. Even the way the sun moved across the grass felt different and seemed to happen quickly. Eventually we came to what would easily become my favorite location of the day – Loch Eriboll. I could have stood there all day staring at the stunning view, if not for the wind. By the time we reached this particular look out spot, the wind was so strong we could barely open our car doors. My sister was blown against the front of the car as she tried to take pictures, and when I attempted to crawl back in, the wind closed the door so hard on my leg I had massive bruises all around my knee for 3 1/2 weeks! We didn’t make it very far before we were stopping again, this time for sheep! These adorable creatures are everywhere in Scotland, but these were some of the closest to us. One of the goals my sister developed upon our arrival in Scotland was getting a sheep selfie. Stirling seemed like the perfect place, but every time she approached the fence, they would run away. They all seemed to not trust her, and that string of bad luck followed her around Scotland, as evidenced by the impressive expression on the sheep below. This was by far the day we pulled off to the side of the road most frequently. Not much time had passed before we were pulling off and stretching our legs to explore the beautiful Ceannabeinne Beach. In attempting to find the name of this beach – as I didn’t notice any signs while there – I came across the sad story associated with it. The beach was traditionally known as Traigh Allt Chailgeag, which stands for ‘the beach of the burn of bereavement and death’. According to the tale, an elderly woman fell into the burn and drowned. Regardless of the tragic tale, I highly recommend stopping by the beach as you drive – or bike! – past. You won’t be disappointed. We finally made it to Smoo Cave, only to discover my fear was correct. Due to the high winds, the boat tours into the inner cave had indeed been cancelled. Still, the walk down the seemingly never-ending set of stairs was worth it for the outer cavern and waterfall alone. Smoo Cave is located just east of Durness, and the limestone cavern is impressive from the moment you first see it (or maybe it’s just relief at finally making it down all the stairs!). Smoo Cave boasts a large entrance – 50 ft! – and was formed by both sea erosion (outer cave) and a river (inner cave). Though we were unable to partake in the boat tour, we did walk down the covered bridge to see the waterfall. For some unknown reason (excitement? stupidity?) I left my underwater camera in the car, and was kicking myself for it as the best shot I got on my DSLR was a slightly blurry, somewhat foggy image of the waterfall. Smoo Cave is absolutely worth the time and money it takes to get there. The tour into the inner cave would have been phenomenal, and sadly, it remains on my bucket list. For now, it was time to wheeze back up the stairs and continue on our journey. The winds eventually died down slightly, but it began to rain off and on. At times, when we were close to the water (frequently), the wind was strong enough to pick water up to create misty clouds. Miniature hidden waterfalls and beautiful heather added to the appeal of the surrounding countryside as we continued our drive down to our stop for the night – Ullapool. Another surprise spot we stopped at was Dileab nan Lochlannach, home to a Viking legacy. History suggests the area was conquered by vikings in the 9th century, and that for a time they flourished there. Even with the misty rain, it was easy to see how beautiful the landscape was. Our final stop before we reached Ullapool happened when we noticed castle ruins off to the right hand side. I was immediately giddy with excitement, as this was the type of castle I longed to see. Jen opted to wait in the car, but Mom and I eagerly began the walk towards the castle. The rain was becoming more of a drizzle, and the wind was biting and chilly, but we trudged on. As we ventured closer, a sign informed us we were looking at what was left of Ardvreck Castle. The castle dates back to just before the 1500s, at a time when it was owned by the Macleods of Assynt. The MacKenzies seized control in 1672, and built Calda House, the unstable ruins of which can also be seen nearby. We finally made it to Ullapool in time for the rain to start in earnest. We chose to eat dinner at the hotel, and spent the night lounging around and talking, enjoying each other’s company. Our day had been full of stunning sights mingled with fighting the elements – particularly the wind – and none of us felt particularly motivated to explore the town in the howling wind and stormy rain. In the end, I wish we had, but more on that in the next post! Stay tuned. Have you been into the inner cave at Smoo Cave? Thank you!! It’s a truly stunning country!